This update brings some major changes to Heads Leaderboards. But don't worry, it's still backwards compatible with your old leaderboards!! :) The first change you will notice is that the leaderboard.yml is gone and replaced with a Leaderboards directory containing a separate file for each leaderboard. Everything else is related to MySQL leaderboards. In the new yml's for the leaderboards you will notice plenty of new options. First, Database is now a variable for each leaderboard. This will allow you to connect different leaderboards to different databases. Solving one of the most requested features. Second, you will notice a variable for usingUUID. When set to true, you can use a UUID column instead of playernames and the plugin will plugin the playername from Mojang. Third, you will notice the variable for multiStat. When enabled and setup this will allow you to show two stats on one table. 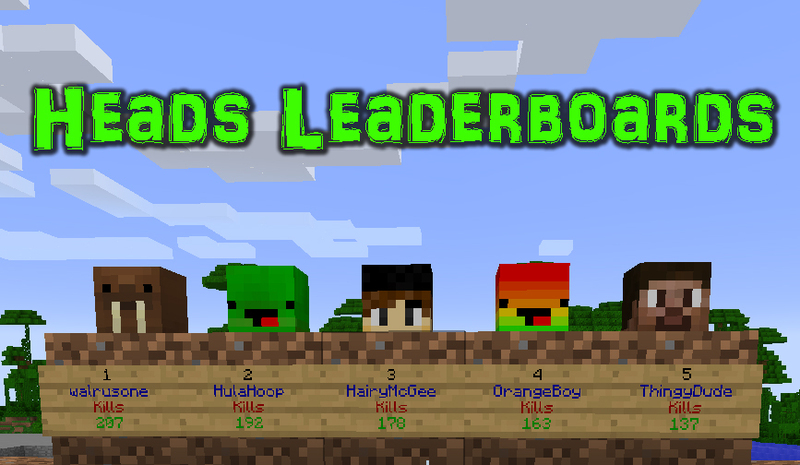 For instance you could have a pvp leaderboard that shows both Kills and Deaths of the leaders. The leaderboard will still be sort by the first stat. FFS - Head's Leaderboards Finally Supports Flat File Storage. You don't have MySQL, NO WORRIES. Supports both JSON and YML filetypes. Supports files named by UUID or PlayerName. This plugin allows you to create sign leaderboards (with heads) using data in a MySQL database OR Flat File Storage. This plugin does not track any player data!! It merely gives you another way to display the data stored in your MySQL database OR store by minecraft or other plugins in Flat File Storage (Such as Kills, Wins, etc...). Copy the Jar file to your plugins directory. Edit the created config or use the Setup command to enter the required information for the MySQL database. Enable the plugin using the Enable command or by updating the config. Edit the leadarboards.yml or use the Setup command to enter the required information for your leaderboard. Enable your leaderboard using the Enable command. Create leaderboard signs and place heads above them. Place a sign, putting [hlb] on the first line, <the leaderboard name> on the second line, and the position you want to display on the sign on the third line. Optional: Place a Skull above the sign (either directly above or on top of the block the sign is on). Run /hlbupdate or wait for the leaderboard to update!! Customizable colors for HLB signs. The ability to do reverse order leaderboards. The ability to set the length of the leaderboards. The ability to use databases that store player names in a separate table. The following plugins have been tested and work with HeadsLeaderBoards. In addition, any MySQL database created by a bukkit plugin should work. If you encounter a plugin/database that doesn't work, please create a ticket and I'll look into it. This plugin now uses Metrics. This will help me keep track of how many servers are using the plugin. The plugins metrics can be view at the link below. To opt out of metrics, set opt-out: to "true" in the metrics config in your plugins directory. Hi! I'm just trying setting your plugin "heads leaderboards" but when I do /hlbupdate , after i've placed the signs, does not happen anything! I think that mysql configuration work but i can't find the problem... Can you help me? PLEASE! I'm having the same problem. Trying to find a fix outside of this plugin in hopes that it is something that can easily be fixed. If I find something, I'll let you know. EDIT: So I've decided to just use PvP Stats with this. It's super easy to set up, allows you to clear it, and some other options. You should consider it, unless you don't have a MySQL database. Good luck! Hello walrusone, in the new updates when you use the plugin using the Flat File Storage and then you set UUID as true. The signs show old players usernames which disables their skins to be shown aswell. Need help as soon as possible. do i have to use SQL? Can i use this to make a vip leaderboard based on group? I would like to make a vip only leaderboard. Amazing plugin!!! Thanks a lot!! Note: Would it be posible to have the skull on one side of the sign? I just want to say that i really like this plugin! Great work! But please can me help someone to connect to my lolmewn stats blocks placed? If this isn't possible then to kills? Or is there a tutorial? Walrus i currently have a server with mcprohosting and im trying to make this headleaderboards work with skywars but im just haveing problem with the first setup, it says there is a problem, what should i do? Wow what a easy setup! Thanks for this plugin! Wow that was really easy to setup. Thanks, this is awesome. I've though about this before, but didn't think it was necessary. I will consider it before my next update. As for the ability to have multiple stats on one sign, I was already thinking about that, but only thinking about stats in one table. To pull stats from multiple tables will be a little more difficult, but it is probably something that can be done. Sorry for the bugs in V3.0. They have been fixed and a new file is awaiting approval now. Most of what you are asking for will be in an update being released tomorrow!! Sorry it took 8 days to reply. What I mean is I the server owner gets to choose where every variable is assigned on the sign. So Kill on line 1. The # of kills can be on line 2, name on 3 and the rank they are 4th. Just an example. And can you add support for prefix and suffix of the variables?